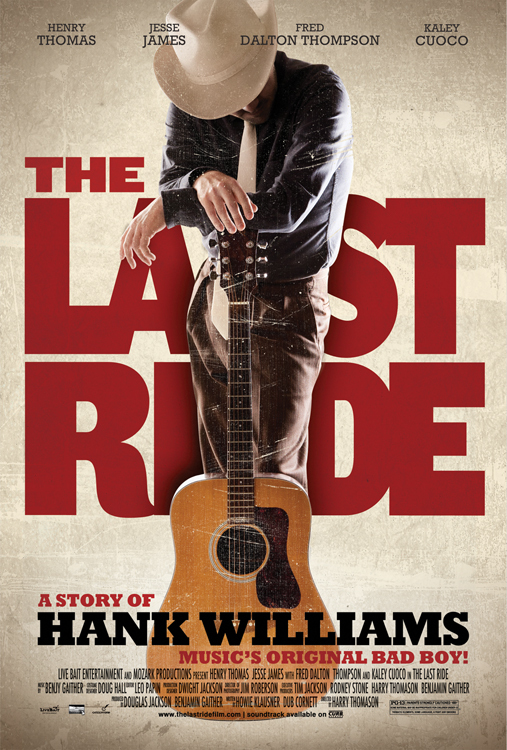 The long-awaited movie about the last days of Hank Williams called The Last Ride has finally been granted a theatrical release. It will begin to be shown in select theaters June 22nd, and in a series of historic theaters starting June 1st. The movie was previously shown in 7 cities in late October of 2011, mostly around Arkansas where the majority of the movie was shot, and both director Harry Thomason, and Henry Thomas (Elliot from ET) who plays Hank Williams are originally from. At that time it was reported a wide release date would be granted sometime in January of 2012, but that release never came. The film will begin a tour of 10 historic theaters around the country (see dates below) as a partnership with Lou Reda Productions. To make a small contribution to the restoration to beloved historic theaters around the nation, “The Last Ride” is partnering up with Lou Reda Productions and a number of historic theaters to allow an exclusive screening of the film before it opens widely. I seems appropriate that a film about a historic American like Hank Williams is being used to help restore an important piece of America’s heritage – its movie palaces. The film will then be shown in New York, Los Angeles, Phoenix, Atlanta, and Austin, TX from June through August, with more cities potentially to be added soon. On January 1st 1953, Williams was scheduled to perform in Canton, OH. Because of bad weather, he couldn’t fly as planned, and hired a college student Charles Carr to drive him. Hank suffered from chronic back problems, and had injected himself with morphine during the trip from Knoxville, TN and also was drinking alcohol. Hank Williams died of heart failure sometime that night with varying accounts of exactly where and when, though a gas station in Oak Hill, WV is given credit as Hank’s final destination. Hank was 29. The movie seems to be going through the same distribution dilemma many small, independent films get dogged with these days. Two other movies that had strong musical ties, Bloodworth, starring Kris Kristofferson, Dwight Yoakam, with an appearance by Hank Williams III, and Last Rites of Ransom Pride, also starring Yoakam and Kristofferson, with score and screenplay contributions by Ray Wylie Hubbard both struggled to find distributions channels, leaving curious fans frustrated. Sure wish this would be released somewhere within driving distance! Had seen the trailer a while back and forgot about this one…but it looks like a real interesting movie! Oh this one is an interesting movie! Wonder why they didn’t try Cannes this year. Could have done things or two and will get public’s attention for sure. Looking forward to this. Thanks! Triggerman, have you had a chance to screen it? No, unfortunately I haven’t. And when talking to the ad agency promoting it, they didn’t seem too excited at the idea of making it available to me. It’s being screened in Austin in July, but I probably won’t be here, so I’m hoping to catch it somewhere when I’m moving east to west over the summer. The few reviews online have been mixed. I’m keeping my expectations measured. Chances are, if it was a blockbuster, it would have received better distribution by now. I hate the poster artwork. It looks like some nasty, commercial Music Row album cover. And as for that tagline “Music’s Original Bad Boy!”. Urgh. It makes me worry a bit about the quality of the movie. I dont know what to think of this film. When I heard they were making it, I was very excited and I thought it was about damn time. I did not like the choice of Henry Thomas as Hank..
Also, I have read several books and biographies on Hank and I dont think they are portraying him the right way from the trailer. Of course we all know that hank was the first “rock star” but this seems a litte extreme. After reading all of those books, I can imagine ol hank and my imagination and this trailer are not even close. Ill watch it but I can tell it is not what I hoped for. We finally get a theatrical release of a hank williams film and this is what they came up with.. good luck trying to get someone to fund another film that will be done the right way..
given what’s already been said here about the film i won’t be making the hour plus trek into lala land to see the movie. i’ll wait it out. thanks for the heads up though. Hank 3 should be playing the lead role. There’s also another, older film starring Sneezy Waters called “Hank Williams: The Show He Never Gave” that portrays Hank better than this film will. This movie looks terrible. I’d love for it to prove me wrong. This movie looks fantastic; I can’t wait to see it. However, I am baffled that it won’t even be shown anywhere in Alabama since that is where Hank lived and wrote most of his music. We have plenty of historic theaters here for it to be shown. Bad call on not showing it here. I read this interview with Henry Thomas today. Thought it was pretty good. Meriah Doty: Since you play a country music legend in “The Last Ride,” I’m curious: Are you country music fan? Henry Thomas: I have been by proxy. I grew up in a rural South Texas community so I heard a lot of Texas music growing up. There’s a soft spot in my heart for some old ’60s and ’70s country, but I’m not a big fan of the big commercial country music in any way, shape or form. I really like that kind of bluegrass, old-time music that Hank Williams’ music came out of. MD: You depict him at a time of his life when he’s sick. It’s clearly a dark time in his life. Did you find it personally difficult to take that on when you were shooting? HT: Yeah, it wears on you after a while. Playing dark moments or dark places in people’s lives. You certainly take your work home with you a little bit. There’s also a great wealth of humor. I think the real Hank Williams — he had a real sense of humor. You could tell from his song writing and everything. In this piece, I really enjoyed playing the comic moments of it just because you need that kind of levity. I think he makes an excellent point regarding Hank Sr’s sense of humor. I think part of the beauty of the Mother’s Best recordings is how that sense of humor comes through in some of the talking interludes. Will this movie ever be released on DVD ? can I buy this movie my 93 yr. old aunt wants to see it. ??? Watched the movie on 22/2013 on TV. I am a country music fan and Hank Williams fan and I thought the movie played very loose with the facts. I did not like the movie at all.